Due to a possible defect in the refrigerators in some of the Guest rooms at the Walt Disney World® and Disneyland® Resorts, as well as Aulani, A Disney Resort & Spa, Resort hotels at these locations have removed or temporarily disconnected Guest room refrigerators until the issue can be resolved. Guests staying at these Resort hotels will be notified of the refrigerator removal via a letter in their room. Currently the schedule for replacing the refrigerators at these Resorts is expected to last several months. This is for all Resorts, except Disney Vacation Club rooms and the cabins at Disney’s Fort Wilderness Campground. Currently we do not have an exact time frame for when the fridges will be replaced, but it is expected to take at least 4 months. At each Resort there will be a limited number of refrigerators available by special request. It seems DVC rooms and suites are NOT affected. More information about the fridge removal can be found at Stitch Kingdom. So, what does this have to do with Disney Weddings? As you probably know, you can request Disney save the top tier of your wedding cake for you take home and keep for your first anniversary. We did this, and since we were staying at Disney for four days after our wedding, we kept our cake in our mini fridge. Special request a mini fridge for your room. Disney says there will be a few fridges available for special needs. They probably mean medical or dietary needs, but cake counts as a dietary need, right? You can tell them to mark a fridge for your room but note that it’s low priority. Maybe you’ll get lucky. Rent your own mini fridge or bring a cooler. Renting a fridge might seem a little extreme but this is DISNEY CAKE we are taking about here. The cheaper alternative is to bring a cooler that you can fill with ice to keep your cake cool. Don’t forget to bring a plastic bag to put around your cake box. Ask your wedding coordinator if the hotel kitchen/bakery can store your cake for you. I have heard from a handful of brides that this was done for them anyway, without them even asking! They simply retrieved their cake when they were ready to leave the resort. Ask a trusted guest to take your cake home until you can retrieve it. They will probably demand some sort of payment, like a slice of cake in return. This is a risk you might just have to take. EAT YO CAKE! Don’t save it for next year! Treat yo self now and eat it for honeymoon breakfast. There’s nothing better. Lots of couples who get married at Disney don’t live nearby and traveling with cake is not an option, anyway. If you go back to Disney for your first anniversary, be sure to order a replica top tier! Any other ideas or suggestions on this very important topic? I hate to think of all the wasted cake. Please chime in! Something must have happened to call for a sudden yet non-urgent removal of the fridges. They are removing them as the rooms vacate. Must be a secret law suit or something. I hope they replace the fridges and don’t just do away with them altogether. 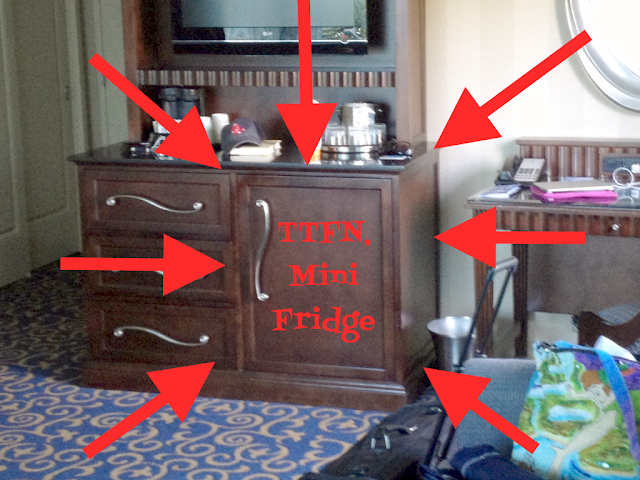 We depend on our fridge on mini-vacations to keep our libations cold. That bucket full of ice just doesn’t cut it. Another idea I had was possibly keeping the A/C in the room a little lower to make the room cold and leaving a note for housekeeping letting them know not to mess with it because it will mess up your cake. I think your other ideas are better though, especially the eating it right away and the having someone taking it home for you idea (assuming that you’re a local bride). We saved the slices that we couldn’t eat at the reception for breakfast the next morning and our top tier was sent home with guests along with some wedding gifts. Disney has said they will be replacing them and it will take at least 4 months, but I believe they are being cautious with information since they have to replace thousands and thousands of fridges! There are really cool travel/multi-adaptor mini fridges that are great not only for hotel rooms, but intended for car travel, which for the non-local bride could be a life-saver if you want to save that cake. My family has a fridge that has a car adaptor and a wall plug adaptor so you can bring refrigerated food on the go and it fits nicely in your car and doesn’t take a lot of energy. It’s one of the best things my family purchased for travel and is constantly used.